India, Mauryan Empire. Punch mark silver. 321 to 187 BC. Mauryan Empire. 321 to 187 BC. Size : 13.0 x 14.4 mm. Weight : 3.37 grams. Obverse : Several punch marks, that probably identified the King and mint, and were individually punch into the coin, probably before it was trimmed to proper weight. 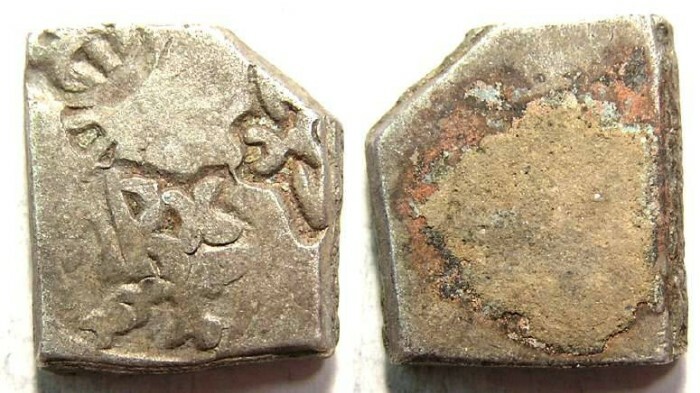 It is normal on these for most or all the marks to be fragmentary (running off the edge) and specimens with all marks fully on the coin probably do not exist on the Mauryan series. Reverse : what ever mark is there is obscured by an encrustation. We have not been able to attribute this type to any of those listed by Mitchiner in his series ORIENTAL COINS AND THEIR VALUES, however several of the marks are clear an it should be possible to identify it fairly easily.